'Dena's Delight' (Eleanor McCown, R. 1981) Seedling #77-2. SPU, 48" (122 cm). Late bloom. Standards light reddish purple (HCC 10p 6/9); falls moderate orange yellow (7.5YR 8/8) bordered light reddish purple. 'Arbitrator' X 'Imperial Beauty'. Cordon Bleu 1982. Honorable Mention 1984. From AIS Bulletin #245 July 1982 Introducing DENA'S DEUGHT. 54" A voluptuously imposing specimen with three to four wellplaced blossoms open at once. Standards are bright violet. 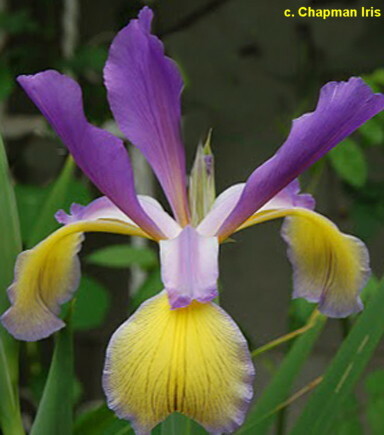 Tne round, ruffled falls are orange-yellow, attractively lined brownish purple and bordered bright violet. Blooms very early. Named in honor of our perennial treasurer of the iris and daylily societies, Dena Daugherty. Arbitrator X Imperial Beauty. $15.00. Cordon Bleu Farms.